We've spoken in this space about Wells Fargo Bank and its (relative) virtues among the financials, and recommended buying WFC on a number of occasions through the autumn of 2008. Sadly, Wells did not escape the fate of the rest of the financials, though it held out somewhat longer (cold comfort for those of us still holding). And at this point, WFC has had its skin peeled and salted, recently falling over 50% in only three weeks! That said, Wells Fargo currently offers a promising trade both for those who purchased and those who managed to avoid the recent financial downdraft. Wells Fargo stock currently exchanges for $10.91 a share. Wells' April $12.50 calls are currently selling at $2.15 (bid). Buy the shares and sell the call for a total return of $3.74 if the shares are called at or before the April 17th expiration. That's 34.28% with an accompanying 20% downside cushion from current price levels. If you like the stock, as we do, the trade offers tremendous value. For those who are already invested, it also affords a means of fixing some of the recent loss through premium writing. And note well: the premium on the April WFC $12.50 calls is a massive 19.7%. Given current volatilities and the likelihood of WFC reaching the strike price by expiration, we see great opportunity in the trade. As mentioned, WFC got caught in a downdraft largely not of its own making. The company is not without its issues, but they do not begin to approach the red zone danger bleeps of a Citi, or even Bank of America. Much of the selloff in Wells' stock is attributable to trade in financial mutual funds and ETFs – both leveraged and not – that oblige selling WFC when they're sold. 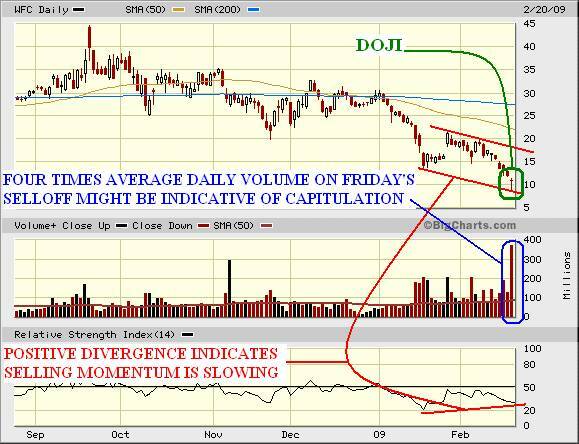 The massive volume seen in last Friday's trade – 4x the daily average – is often indicative of a blowoff bottom. Positive divergence between the RSI and the price action is indicative of a slowing of selling pressure. The doji (a Japanese candlestick chart pattern that can point to a reversal) of last Friday. The fact that WFC opened and closed near the highs for the day and plumbed significantly lower during trading is significant. So, too, are the gap down from the previous day's low and the doji's arrival at the end of a full week's fierce selling. Confirmation awaits, but for now the signs are positive. To sum, WFC will ultimately rebound, and selling calls against it is both good repair for longer term holders and prudent trading for conservative investors seeking income. Housing? I thought the idea was to make money. Another sector that's plied the depths alongside the financials is the homebuilders. On this group, too, we've written extensively since the crisis hit, and we've even recommended one name that we believe to be a standout, Pulte Homes. The chart on Pulte homes shows a company that has suffered since our recommendation, but not nearly to the same extent as Wells Fargo and the financials. Pulte is experiencing severe overhead resistance at $13. Several runs at that level in the past five months proved limp, and, in the meantime, Pulte is building a strong base. 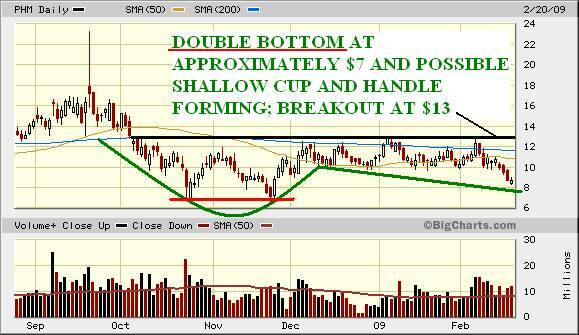 The stock has put in a double bottom at roughly $7 and may now be building a long term, shallow cup and handle pattern. Of course a breakout above $13 resistance on powerful volume will be necessary before the pattern is confirmed. Our view is that as long as the stock remains buoyant above the $7 double bottom, a breakout is inevitable. Pulte Homes (PHM:NYSE) currently trades for $8.71. Pulte's April 10 calls are currently bid at $0.85. Total return on the trade if shares are called is $2.14 – a giant 24.6% take in less than 60 days – and a downside cushion of nearly 10% should the stock fall from current levels. Like Wells Fargo, the call premium offered in the Pulte trade is very rich at 9.76%. There are few candidates for covered writes that offer such fat premiums and are still worthwhile stocks to own. We stress that for those still in possession of either or both of these recommended stocks, selling premium is a great source of income and offers trade repair possibilities. To close, both of these stocks have been hit by emotionally driven selling of a notably limp-wristed variety and their downside now appears limited. Collecting option premium also minimizes any downside risk. Neither company is going out of business or is under threat to be nationalized. Both are in industries that the government is actively attempting to assist (like it or not), and both will emerge – however bruised – from the current crisis stronger for the damage they've sustained. Moreover, ongoing sales of options against these stocks ensures a continued income stream. The Residual Income Report recommends the immediate sale of one April $12.50 call for every 100 shares purchased of Wells Fargo (WFC:NYSE). The sale of one April 10 call for every 100 shares purchased of Pulte Homes (PHM:NYSE). After graduating from Harvard University in 1989, Matt worked as a Financial Advisor at Wood Gundy Private Client Investments (now CIBC World Markets). After several successful years, he moved over to the analysis side of the business and has written extensively for some of corporate Canada's largest financial institutions. Oxbury Research originally formed as an underground investment club, Oxbury Publishing is comprised of a wide variety of Wall Street professionals - from equity analysts to futures floor traders – all independent thinkers and all capital market veterans.